SAP provides solutions in a number of functional modules, these SAP ERP modules support almost all transactions to execute key business processes. Below are SAP available in different modules. The Sales and Distribution application caters to the business processes associated with customer order fulfillment. SD has several components offering diverse functionality. You need new sales solutions designed for the way your sales people sell today – and are a breeze to use, affordable, and quickly integrate with your whole back-office operation. SAP FI stands for Financial Accounting and it is one of important modules of SAP ERP. It is used to store the financial data of an organization. SAP FI helps to analyze the financial conditions of a company in the market. SAP Financial Accounting (FI) is an important core module where in live-time, the financial processing transactions are all captured to provide the basis via which data is drawn for external reporting. SAP Solution Manager supports and manages SAP and non-SAP applications in an SAP ERP environment, including such tasks as managing custom code and overall system performance.SAP Solution Manager can pro- actively controls Solutions and avoids error in Implementation and Operations thus increasing the reliability of IT Solutions. The tools and Contents delivered with Solution Manager improves the efficiency of Upgrade, Support, Implementation, Roll out and Change Management Projects. 2.Common monitoring tool CCMS(Computing Centre Management System) to monitor alerts of R/3 system from one place. 4. Use of Business server pages to build online stores and portals. 6. Resource management like memory, buffer, etc. 7. Authorization and profile management tools for user management. 8. Internet access control to the system and business objects. 9. Transfer modifications in a screen, program, layout from the development to a production system for accuracy purpose by Transport Management System. 10. Client-server architecture and configuration. 11. Graphical User Interface designing for the presentation layer. The security threat in the enterprise is relentless and multiplying, and the attackers are getting more sophisticated. Around the world, there is tremendous concern around information security. Business partner, customer and personal data is processed in various modules and processes within an SAP® system and is stored in numerous tables. As a result, the possibility of this data being accessed and misused exists. To avoid these vulnerabilities, we support you to implement an SAP security concept for your entirely system. 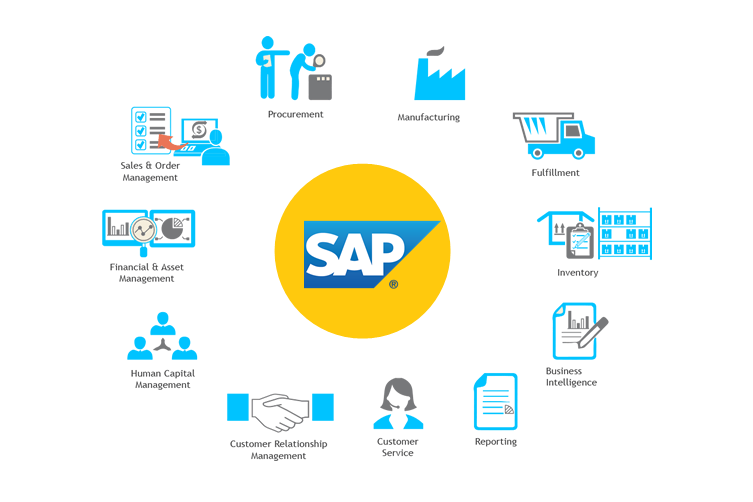 SAP Supplier Relationship Management (SRM) is a perfect solution to help you manage your suppliers, take care of your contracts, speed up your procurement processes, and more. With SAP SRM, you can maintain high-quality output while being able to keep your supply costs down. This ultra-efficient SRM platform enables you to streamline and standardize the acquisition of goods and services while allowing you to close the loop from source to pay, thus effectively reducing procurement expenses. SAP Supplier Relationship Management (SAP SRM) gives you unique methods to help you coordinate and facilitate your business processes with your key suppliers and dramatically improve their effectiveness. With SAP SRM, you are able to fully optimize your procurement methods, to work more effectively with your supplier pool, and thus to get much more from all your relationships with your suppliers. SAP SRM helps you evaluate and predict purchasing behaviour, cut down procurement cycles, and engage your partners in real time. The system enables you to create and foster long-term partnerships with all your suppliers who have proven themselves to be very reliable and valuable to your business. The SRM solution bolsters your organization’s efficiency by automating operational processes to increase efficiency while taking maverick buying out of the equation. Consumer grade shopping interfaces make it easy for users to adopt the system and make it work for them. Companies love how SAP SRM helps them achieve greater visibility into supplier relationships and performance as well as expedite procurement processing and cycle times. SAP Supply Chain Management (SAP SCM) enables collaboration, planning, execution, and coordination of the entire supply network, empowering you to adapt your supply chain processes to an ever-changing competitive environment. SAP SCM can help transform a linear, sequential supply chain into a responsive supply network – in which communities of customer-centric, demand-driven companies share knowledge, intelligently adapt to changing market conditions, and proactively respond to shorter, less predictable life cycles. SAP SCM provides broad functionality for enabling responsive supply networks and integrates seamlessly with both SAP and non-SAP software. Customer Relationship Management (SAP CRM) offers deep analysis and insight to anticipate consumer needs and create profitable, lasting customer relationship. In other words, consumer interaction plays an essential role in determining the success of your business. It helps in building consistent and relevant interactions across all branches that handles customers. This module helps organizations in driving customer value, loyalty and profitability across the entire value chain of an organization. Customer satisfaction is one of the common aims for every business and we helps to achieve the same.The SAP® Customer Relationship Management application helps you distinguish your organization as you grow by promoting collaboration with your customers and providing exceptional interactions and experiences across all customer touch points. The SAP® Business Planning and Consolidation application accelerates planning and consolidated financial reporting processes. It supports planning, budgeting, and forecasting capabilities with management and legal consolidation functionality in a single application. It reduces Reduced planning and consolidation cycle times, give More accurate plans, budgets, and forecasts, increases stakeholder confidence, Minimize compliance risk and Improved data quality. When it comes to planning and consolidations utilities are facing external challenges with high volatile market, fast moving trends, increasing regulatory compliances along with internal challenges such as inconsistent processes, limited alignment between strategic planning and annual budgeting, prioritizing/ sequencing statutory and/or management consolidations. We believe that BPC will be a booster for integrating planning and consolidation together and improve financial reporting and analysis capabilities. It will help to enhance overall scalability and performance for faster decision making with enhanced IT and business usability. The SAP® Bank Communication Management (BCM) provides companies with seamless bank communication with their multiple banks and enables a company to take full advantage of all the benefits of standardized electronic payments such as the SEPA initiative. BCM in combination with the SAP® Integration Package for SWIFT enables the seamless integration with the SWIFTNet infrastructure, a secure and reliable infrastructure for companies to communicate simply and efficiently with their multiple banking partners. Regarding external payment transactions, in most companies multiple and technically different banking connectivity prevails. Bank communication can, thus, become an in transparent, insecure and expensive matter. By implementing the module SAP® Bank Communication Management, helps companies to put such things right: SAP® Bank Communication Management enables you to group payments according to your needs and to process them in certain batches. As a result, you gain transparency, achieve greater security and are able to reduce the costs of payment processes.